2015 ~ Another fun year of rides and events! Ride leaders finalizing next year's ride schedule and will be posted before long. Make sure your dues are paid for 2016 so you can see the schedule! Impromptu ride Friday, Sept 25 to Weis Bar. 2015 Rides being posted now, and the ride leaders will be making final updates. Make sure your membership dues are paid before Feb. 1 so that you can see all the scheduled rides. Always remember to check the COMMENT section for each of the rides on last minute changes! So many cancelled rides this month, why? Want to help with a ride or be a ride leader? Read more. Over 55 rides, campouts, trail clean-ups and special events have been scheduled for 2014. Join a club and come ride with us. Partnering to teach "kids" how to ride an ATV. Volunteers needed for the event. 2013 World’s Steepest Hillclimb – UPDATE! Invite to attend a Desert Fun Run, April 13. Ride the Bayhorse Thank You! Land of the Yankee Fork State Park, Challis Area Chamber of Commerce, and Friends of the Land of the Yankee Fork wanted to send out a large “Thank You.” See FULL STORY for more information. Ride from Pershall Dam to Indian Meadows for lunch then up to the South Mountain Look-Out then back to the trucks. See Full Story for more details. POSTPONED to June 10-12. See FULL STORY for more details. 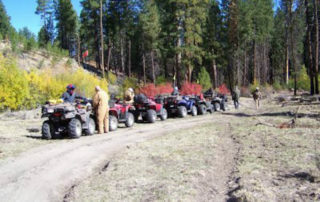 Decorate your ATV or UTV and come ride with us at the 4th of July Parade in Melba, Idaho. Parade starts at 1030 & Parade participants need to be at Melba at 0800. See Full Story for more details. 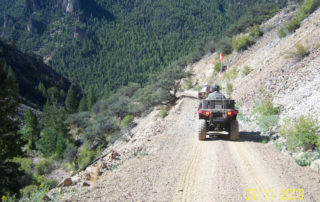 We will ride from the Jump Creek recreation area to Succor Creek State Park in Oregon. INTERMEDIATE ride. See Full Story for more information.